Working with Devon County Council and their local public service partners; supported by DCLG. An ontology to be able to express information such as * Objectives * Strategies * Plans * Resources * Services * Provision * Partners * Stakeholders * Metrics * … and so on. As per the LeGSB White Paper on Open Public Services. Creating a series of ‘dashboards’ for locations and ‘commuities of interest’ that slice the data for that view. Presented LeGSB-Publishing5StarData-August2013-Rev1 to London Borough of Redbridge. Working with Devon County Council to publish Council Decisions, linked to Objectives, via the sand box. 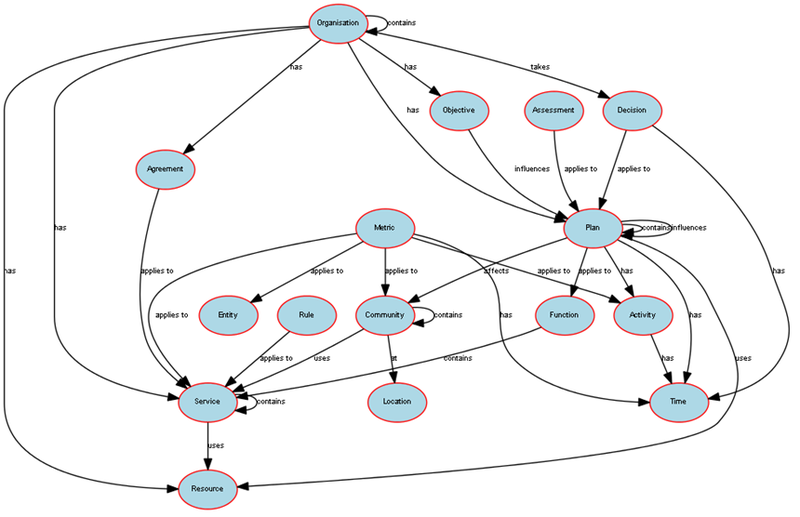 Data Structures from the proposed Open Public Services ontology piloted at the ‘Technical Companion’ sand box at http://www.openpublicdata.com. LeGSB Workshop in Bristol, with Local Authorities and Linked Data experts, to select good practice for linked data vocabularies and URI sets to describe Open Public Services. Following workshops with Devon County Council, we are applying their data to the model, including their Neighborhood Budgetting Pilot. ‘Open Public Services’ Web Site as a demonstrator of real data ( from Somerset C.C., and Sedgemoor D.C. ) illustrating pulling Linked Data from the OPS store. Presented to the GoCompare Event. Workshop data with Devon County Council. Promoted to lots of Councils via the LGA Transparency Events, and Workshops.